A giant cloud of hydrogen gas is speeding toward a collision with our Milky Way Galaxy, and when it hits -- in less than 40 million years -- it may set off a spectacular burst of stellar fireworks. GBT image of Smith's Cloud, which is headed toward a collision with the Milky Way. "The leading edge of this cloud is already interacting with gas from our Galaxy," said Felix J. Lockman, of the National Radio Astronomy Observatory (NRAO), leader of a team of astronomers who used the National Science Foundation's Robert C. Byrd Green Bank Telescope (GBT) to study the object. The scientists presented their findings to the American Astronomical Society's meeting in Austin, Texas. The cloud, called Smith's Cloud, after the astronomer who discovered it in 1963, contains enough hydrogen to make a million stars like the Sun. Eleven thousand light-years long and 2,500 light-years wide, it is only 8,000 light-years from our Galaxy's disk. It is careening toward our Galaxy at more than 150 miles per second, aimed to strike the Milky Way's disk at an angle of about 45 degrees. "This is most likely a gas cloud left over from the formation of the Milky Way or gas stripped from a neighbor galaxy. 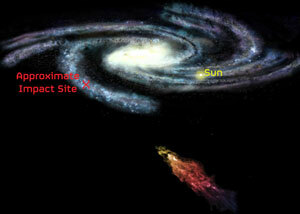 When it hits, it could set off a tremendous burst of star formation. Many of those stars will be very massive, rushing through their lives quickly and exploding as supernovae. Over a few million years, it'll look like a celestial New Year's celebration, with huge firecrackers going off in that region of the Galaxy," Lockman said. When Smith's Cloud was first discovered, and for decades after, the available images did not have enough detail to show whether the cloud was part of the Milky Way, something being blown out of the Milky Way, or something falling in. Lockman and his colleagues used the GBT to make an extremely detailed study of hydrogen in Smith's Cloud. Their observations included nearly 40,000 individual pointings of the giant telescope to cover the cloud with unprecedented sensitivity and resolution. Smith's Cloud is about 15 degrees long in the sky, 30 times the width of the full moon. "If you could see this cloud with your eyes, it would be a very impressive sight in the night sky," Lockman said. "From tip to tail it would cover almost as much sky as the Orion constellation. But as far as we know it is made entirely of gas -- no one has found a single star in it." The detailed GBT study dramatically changed the astronomers' understanding of the cloud. Its velocity shows that it is falling into the Milky Way, not leaving it, and the new data show that it is plowing up Milky Way gas before it as it falls. "Its shape, somewhat similar to that of a comet, indicates that it's already hitting gas in our Galaxy's outskirts," Lockman said. "It is also feeling a tidal force from the gravity of the Milky Way and may be in the process of being torn apart. 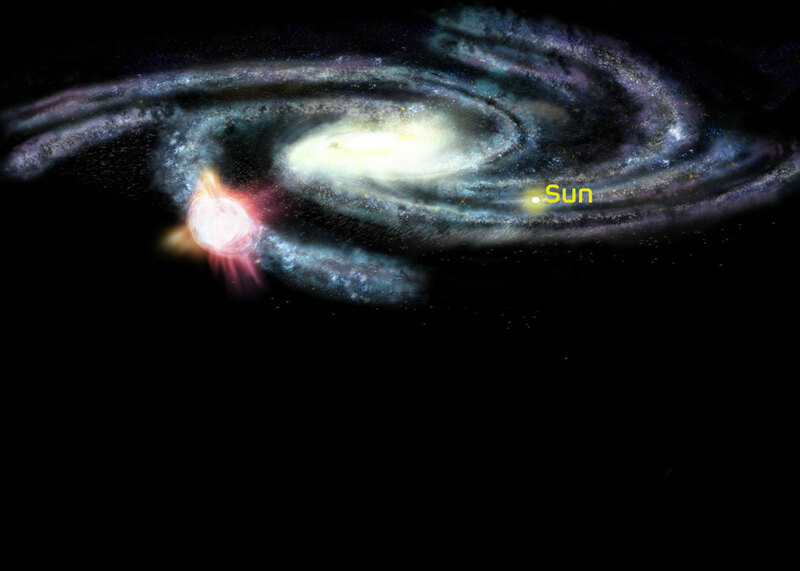 Our Galaxy will get a rain of gas from this cloud, then in about 20 to 40 million years, the cloud's core will smash into the Milky Way's plane," Lockman explained. Artist's conception of Smith's Cloud approaching, then colliding with, our own Milky Way Galaxy in approximately 40 million years. Sequence of images shows the approach and collsion. 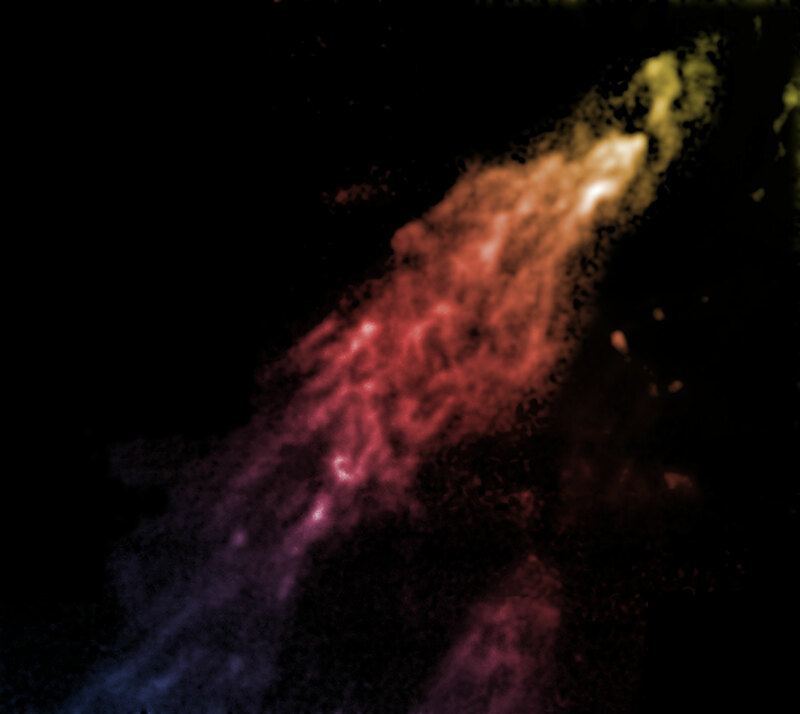 Detail: GBT image of Smith's Cloud. The cloud will likely strike a region somewhat farther from the Galactic center than our Solar System and about 90 degrees ahead of us in the Milky Way disk. 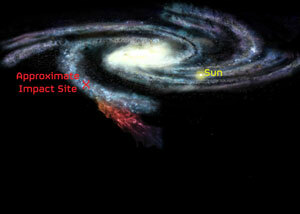 The collision may trigger a period of rapid star formation fueled by the new gas and the shock from the collision. Some theories say that the ring of bright stars near the Sun, called Gould's Belt, was created by just such a collision event. Lockman worked with Robert A. Benjamin and A.J. Heroux of the University of Wisconsin-Whitewater and Glen I. Langston of NRAO.